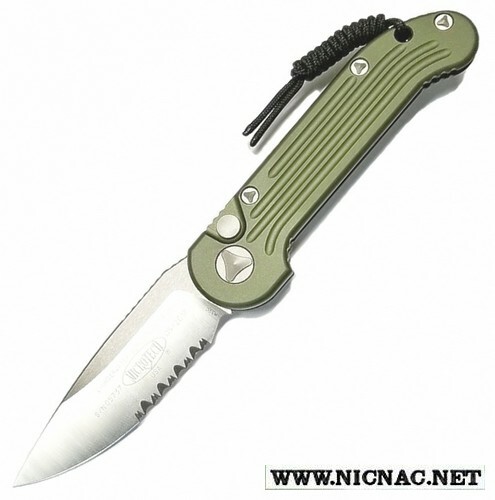 Microtech LUDT 135-5 OD Automatic Knife Olive Drab SERRATED. The Microtech LUDT Automatic Knife is overall open length 8 inches, this automatic Microtech L-UDT knife has a 3.375 inch blade that is .13 inches thick. It has an aluminum handle, is tip up carry and is MADE IN THE USA! The UDT was introduced by Anthony Marfione a little over 20 years ago as the U.D.T. (Underwater Demolition Team) and soon after the Large (LUDT) was introduced. The Microtech L.U.D.T. Side Action Automatic knife is overall open length 8.63", 4.60" closed with a blade length of 3.4". 3.6 oz. This Fully Automatic Side opening Folder comes with textured black anodized aluminum front and a tip up pocket clip. These automatic knives were the original designs for Large Underwater Demotion Team Knife and are back in a new Microtech Knives release.